KUWAIT CITY: The Embassy of Italy in the State of Kuwait has launched a new Italy Visa Application Centre in Kuwait City, Kuwait, in a move aimed at bringing greater proficiency of visa application processing services and enhanced customer experience to the residents of Kuwait. Services at the new centre are operational from 26 November 2017 onwards. Travellers to Italy from Kuwait can visit the centre, managed by professionally trained VFS Global staff, to submit their Italy visa applications and enrol their biometrics in a comfortable and secure environment. The new centre, which is centrally located at Level 54, Arraya Tower, Al Shuhada Street, was inaugurated by H.E. Mr. Giuseppe Scognamiglio, Ambassador of the Embassy of Italy to the State of Kuwait, at an official ceremony held on 23 November 2017. At the centre, amongst other services provided for greater convenience to applicants, is the option to submit their applications in the comfort of a Premium Lounge for a more personalised experience. In addition to efficient visa application processing services, applicants will also have access to a dedicated tourism space, which will offer tourism information on a range of hand-picked tours in Italy. 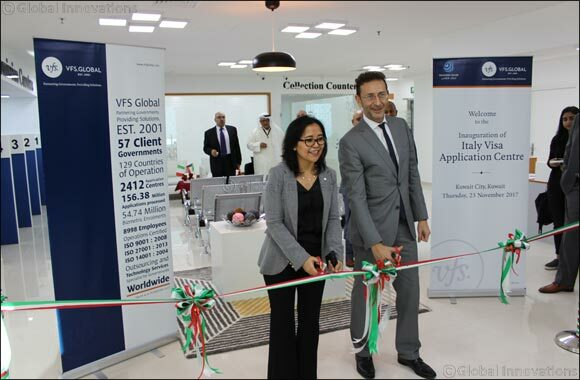 Kuwait is the fifth country in the Middle East from where VFS Global will serve the Embassy of Italy. Worldwide, VFS Global has served the Government of Italy since 2004, and currently manages visa processing operations for the client government in 28 countries from 66 visa application centres.